A lucid dream is a dream that the dreamer has become aware of, and can consciously manipulate through varying degrees of control. 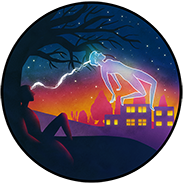 It is similar to an astral projection in that the dreamer is experience consciousness outside of the body. Lucid dreams have inspired many works of fiction, notably the 2010 Sci-Fi movie ‘Inception’, in which characters explore differing levels of lucid dreams. Lucid dreaming can happen spontaneously, sometimes when the body is under stress, fatigue or illness. Sometimes, in a dream you may just see something that you know cannot be real, and will be aware you are in a dream. A personal experience of mine is seeing somebody I knew was dead, then realising it was a dream, I was able to control my own actions. Some astral projection methods, notably the wake back to bed technique have been known to cause lucid dreams.